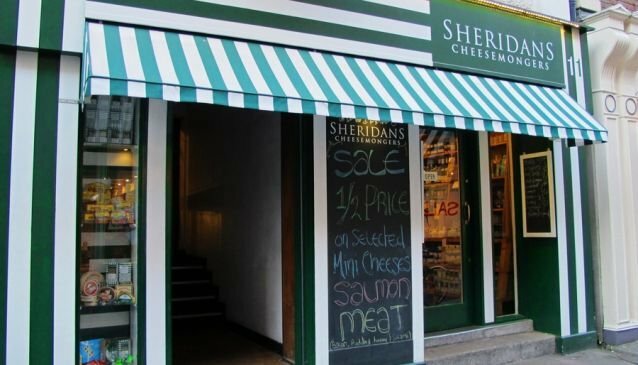 Sheridans Cheesemongers have been retailers and wholesalers of quality Irish (and other European) foods since their founding in 1995. Sheridans is run by owners Kevin Sheridan, Seamus Sheridan and Fiona Corbett. The brothers Sheridan began by selling Irish Farmhouse cheeses at the Galway market. It wasn't long before they opened a shop in Galway, stocked to bursting with those same quality cheeses. Fiona then joined in 1997, and that's when Dublin markets and a shop on South Anne Street (in the city centre) joined the 'empire'. At this stage, the Irish cheeses were kept company by an influx of European varieties, and a huge range of other artisan foods (olive oils, cured meats, condiments and pasta) were also added to the spectrum of products available. Since those early market stall days, Sheridans has expanded to include a total of four retail outlets (in Galway, Dublin, Carnaross and Waterford), a variety of market stalls (in Galway and Dublin) and a purpose-built premises with warehouse, offices and maturing rooms in County Meath (where orders from trade customers are fulfilled). The listing of their unparalleled stock of Irish cheeses is as long as both your arms, but highlights include Durrus, Clonmore, Coolea and Cooleeney Raw Milk Cheese. On top of that, there are the finest continental cheeses available; Cravero Parmigiano Reggiano, Dongé Brie de Meaux, and Marcel Petit Comté to select a few from the many. There are also Rustichella d'Abruzzo Pastas, Ortiz Tunas, Prunotto Italian Pasta Sauces, cheese accompaniments and Luscombe Organic Drinks. And where there's a love of superb cheese, there's got to be an appreciation of fine wine - you'll find an array of wines from across Europe, with a particular focus on Italy. In addition to sourcing the best, the Sheridans kitchen has created a small range of great products bearing the Sheridans Cheesemongers brand. The Sheridans team are convinced that the single most important factor in their success is the customer experience - from the quality of the produce, to the knowledgeable and friendly staff, to the way cheeses are served and presented. Visitors are encouraged to participate in the process and taste as they buy - so don't miss an opportunity to give your taste buds a treat, get a little bit of education on the side, and take away something really delicious.